This one caught me by surprise. I believe it was gwynster who posted about this condo over on the Sac Landing blog. I don't know much about Davis, but unless there's some unseen mystique here, logic has certainly been defied. The condo was remodeled and sold for $660K back on 7/11/06. It was listed for $649K and sold for $11K more in just 4 days. Fast forward a year and it's now pending at $795K!!! $619/SF. I really don't know what else to say. Well Davis has a great farmers market - that's why! Not just farmer's market, but also a nuclear free zone! fraud maybe? cash back or something? No idea. Will be interesting to see the kind of loan the buyer gets. 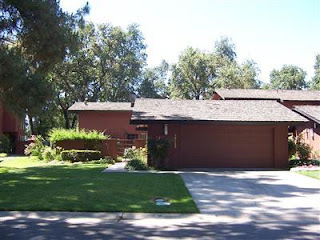 "Exclusive quaint El Macero neighborhood. Enjoy living the good life in your remodeled single story condo, situated on golf course lot! 6th fairway views from almost every room!Granite, woodflooring,and more. Two car garage. Steps to El Macero Country Club, swimming, golf, tennis, restaurant and more. Hurry!" The pictures show it right on the fairway. If the lot was empty, it would be worth the same. Land value. Very many houses in Davis are utter and complete dogs, deepening the mystery. But the agents are a very determined breed. I think they do something to people's minds. Are you trying to imply that LOCATION has something to do with prices? You obviously have not been paying attention to the posters on this board or you would know that all home prices can only go up at the rate of inflation - location has nothing to do with prices. You can thank me for this lesson later....Armed with this great insight, I am going to make some $200K offers on the teardowns in San Diego's Pacific Beach neighborhood - wish me luck! An interesting note in today's SacBee: "Real estate giant Coldwell Banker recently surveyed owners of $1 million houses -- $2 million in California -- and found 40 percent plan to buy a second home. That's 10 percent higher than a year ago. The survey analysts said it reflects millionaire optimism that their houses may be worth more a year from now." It was me that pointed out the glue huffer. It's in El Macero. Now the interesting part is that this "prime" location also has distress sales. The thing is, compare that listing with the 3/3 2,700 sqft home for sale on a damn nice sized lot (over 15,0000). $200K more for a house with 1000 sf more and a larger lot, on the course. Can't hardly find that anywhere. G - you have found a deal - a $989K fixer! Hey G - you can get a "unit" on Moore Blvd for 403K... 1 car garage! LOL I think both homes are awful, just pointing out why the smaller one was especially stupid. Those condos on Moore are awful. We looked at them and they were small, plain, and completely overpriced. Now they are trying to rent them out for 1550 mo for the 2/2. Needless to say the investors there are bleeding money. Amazing the rate at which property appreciates in that area! As Aaron Krowne (ml-implode.com) likes to say, I can't over-emphasize how not good this is. The last time the ABX's started doing this the sub-prime implosion became visible within a week or two. My guess is some bigger Alt-A or prime players are about to implode, or the Bear Stearns problem isn't as contained as we've been led to believe. Either way, the end result is the same: much higher mortgage rates and much less funny money to purchase and/or re-fi with. To my eyes, this has fraud written all over it. No other explanation flies.